It’s heavier and pricier than the X1 Carbon but more versatile. Lenovo's ThinkPad X1 Carbon is the ideal business laptop. But it's also strictly a traditional notebook. If you're looking for something a bit more flexible, the X1 Yoga might be a better option. 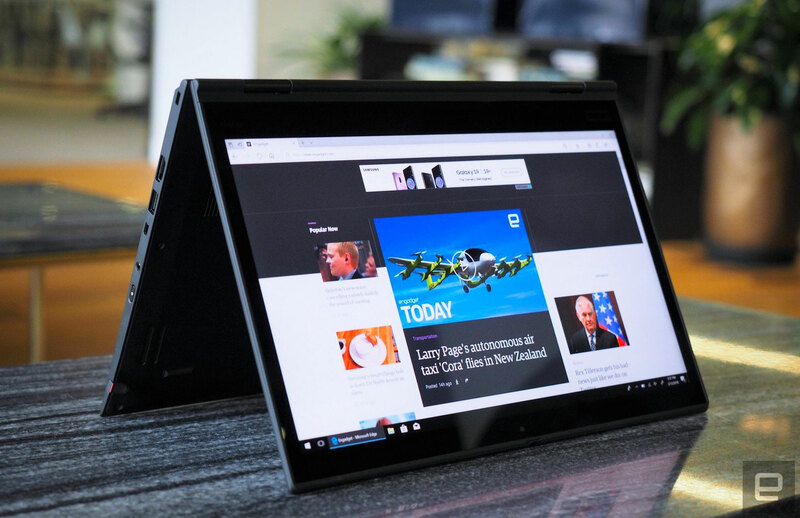 Just like Lenovo's other Yoga machines, it has a hinge that lets you twist the screen a full 360 degrees, letting you use it as a giant tablet or in a tent formation. And of course, it also offers most of the features we loved on the X1 Carbon. The ThinkPad X1 Yoga is meant for business users who want something more than a traditional laptop. It’s different modes are genuinely useful, but you’ll pay for that with extra weight. Be the first to review the ThinkPad X1 Yoga (2018)? The two laptops look pretty similar -- that is, until you put them side by side. They share the same sleek black carbon-fiber aesthetic and sturdy build quality, but the Yoga is noticeably larger. It's also significantly heavier, weighing in at 3.1 pounds compared to the X1 Carbon's 2.5 pounds. The Yoga is more of a throwback to ultraportables from a few years ago whereas the X1 Carbon looks and feels more modern. And while both laptops feature 14-inch screens, the Yoga's display has significantly larger bezels around the top and sides. You can choose from 1080p and 1440p options, and you can also opt for that higher resolution with Dolby Vision HDR. That feature will make black levels and bright highlights look better on supported videos from services like Netflix. Another difference? The X1 Yoga's Wave keyboard isn't as deep as the Carbon's, as it's built to pull the keys into the case when you fold over the display. Still, it's ultimately better than what you'll find on most thin laptops. The keyboard feels on par with Dell's XPS 13, and it's far better than Apple's flat MacBook keyboards. The trackpad is just as smooth and accurate as the Carbon's, and ThinkPad purists will appreciate the return of the red TrackPoint nub. As for other components, the X1 Yoga has a physical-privacy shutter to block its 720p webcam (which is far easier to switch than the Carbon's). When it comes to ports, there are two USB-C Thunderbolt 3.0 sockets, two traditional USB 3.0 connections, a full-sized HDMI port, a headphone/mic jack and microSD and Micro SIM slots around the back. We're keeping this review short because the X1 Yoga and Carbon are basically the same machine under the hood. They both feature eighth-generation Intel Core processors and UHD 620 graphics. They're fast performers when it comes to most productivity tasks, but you won't be using them to play many games. Mostly, we were interested in seeing if the convertible functionality of the Yoga made a huge difference. After several days of testing, the answer is a bit complicated. As you'd expect, the X1 Yoga is a much more flexible machine to use. When I wanted to focus on a long article or dive into digital comics, I appreciated being able to turn it into a huge tablet. Given its size, it's not a machine I would use in that orientation for very long, but it's still genuinely useful. And as is typical for 2-in-1s, the tent mode was helpful for watching Netflix in bed. It also made the Yoga a useful companion to my desktop setup; I was able to keep an eye on TweetDeck while diving into Overwatch matches. As for battery life, it was almost exactly the same as the Carbon, lasting 15 and a half hours in our video-looping test. The X1 Yoga also comes with Lenovo's ThinkPad Pen Pro stylus, which sits in a slot near the fingerprint reader. That makes it a particularly useful machine for anyone who's grown used to jotting down notes or marking up images and presentations with Windows Ink. The stylus is very responsive on the X1 Yoga's touchscreen, but it's still a bit too thin to hold comfortably for long. There's a reason Microsoft's Surface Pen is as thick as a normal ballpoint: It simply feels better in your hands. The X1 Yoga's size and weight are a trade-off compared to the X1 Carbon though. That machine practically disappeared in my bag as I walked around town, whereas I always noticed the Yoga's extra heft. If you're choosing between those machines, you'll have to decide if the added flexibility is worth having a heavier machine. The X1 Yoga is also slightly more expensive than the Carbon, starting at $1,649 compared to $1,519. If you're looking for something lighter and cheaper, Dell's XPS 13 two-in-one is pretty compelling. Microsoft's Surface Book 2, on the other hand, is a more powerful option that'll cost you a bit more. There's no doubt that the X1 Carbon is the star of Lenovo's ThinkPad lineup. But the Yoga still seems like a compelling option for people who want the reliability of the ThinkPad name but want to use their laptop in different ways.